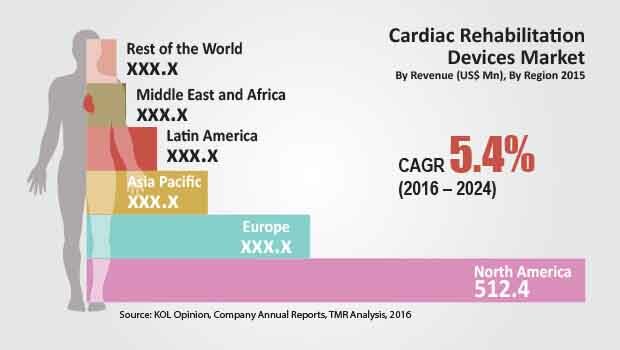 The global cardiac rehabilitation market largely consist of a few strong players who exert control over the entire market. This makes the vendor landscape immensely consolidated, thus, barring the entry and establishment of new players. Transparency Market Research (TMR) prognosticates that product innovations would play a major role in deciding the course of the competitive landscape. The leading market players are expected to keep introducing novel products to retain their dominance in the market. The top two market players viz. Technogym and Brunswick Corporation held more than 50% of the total market share in 2015. The other two key players, Amer Sports and Johnson health Tech Co. are also on the run for a greater market share. All the companies mentioned above collectively accounted for approximately 70% of the global market share in 2015. There are tremendous opportunities for investors because the market is buzzing with the advent of new technologies. The rivalry amongst the established players has been intensifying and the demand in the market has been rising. Owing to these factors, there are lucrative opportunities resting within the market. The estimations made by Transparency Market Research portray that the market stood at a value of US$1,010.93 mn in 2015 and is expected to elevate to a value of US$1,622.9 mn by the end of 2024. It is also projected that the market would grow at a sturdy CAGR of 5.40% over the period from 2016 to 2024. Based on the type of devices, the highest demand was attracted by elliptical trainer segment. The segment accounted for 27% of the total demand and this owes to the multiple uses of such devices. Geographically, North America has reigned over all other regions in terms of demand, accounting for 50% of the global demand. Asia Pacific is expected to register a CAGR of 6.80% over the period from 2016 to 2024. The global market is driven by the rising instance of cardiovascular diseases. The wayward lifestyles of the populace have increased the risk of diseases and have adversely affected the heart rates of individuals. In recent times, the initiatives of healthcare centers to inform people on the importance of cardiovascular health has created a sense of awakening across the world. This has proliferated the demand within the cardiac rehabilitation market. Furthermore, cardiac disorders, dysfunctions, and diseases have contributed to the high rates of mortality and morbidity. The quest of national governments to enhance the healthcare index has driven the demand for cardiac rehabilitation. The geriatric population has also been on a rise in recent times, which further escalates the demand for cardiac rehabilitation. Since the risk of cardiovascular diseases in people aged above 60 years, it is vital to have a swift mechanism of treatment for this section of the population. The concerted efforts of international bodies such as the WHO are expected to enhance the market. The technologies employed within the domain of cardiac rehabilitation are complex and expensive. This makes the cost of products within the market unaffordable for a large population. The restraints on the market intensify when new technologies outdo the cardiac rehabilitation products. The high capital and intensive research employed in cardiac rehabilitation products make it difficult to regulate the costs. Furthermore, the enrolments in cardiac rehabilitation programs are low which adds to the woes of the market. However, the formulation of flexible schedules for cardiac rehabilitation programs can help in overcoming this problem. The initiatives of healthcare centers to inform people on the importance of cardiovascular health has created a sense of awakening across the world. The technologies employed within the domain of cardiac rehabilitation are complex and expensive.